WASHINGTON (Reuters) - The U.S. government paid more than $77,000 (58,750 pounds) to President Trump's Scottish golf resort ahead of his stay there last weekend, according to federal spending records, indicating that Trump's official visit to Europe likely generated revenue for his business empire. Spending records seen by Reuters show that the U.S. State Department, which typically arranges presidential travel overseas, paid $77,345.35 since April to SLC Turnberry Ltd, the Trump company that owns the resort, for "hotel rooms for VIP visit." The payments were first reported by The Scotsman, a Scottish newspaper and website. 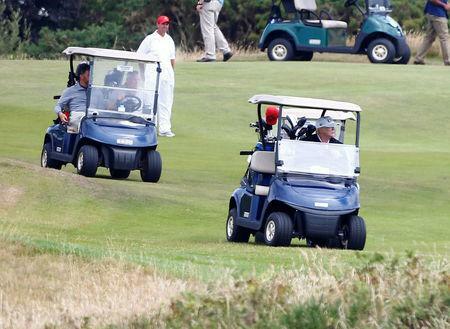 Trump stayed at the resort and played golf there last Saturday, between a meeting of the NATO military alliance and a meeting with Russian President Vladimir Putin. It was not clear whether all of the payments were made to cover expenses for Trump's visit. The State Department paid Turnberry $7,670 in April and another $70,000 in the days before Trump's visit last week, federal records showed. A State Department spokeswoman declined to comment about the charges, and White House officials did not respond to a request for comment. Former government ethics officials and watchdog groups say Trump has failed to put safeguards in place to ensure that he does not directly profit from his actions as president. "This is part of a pattern with this president of really doing everything he can to disgrace the office of the presidency by promoting his own private business interests," said Stephen Spaulding, a lawyer with the public interest group Common Cause. While other recent presidents have put their assets in a blind trust, Trump has retained ownership of his hotels, golf courses and other businesses. He handed control of the businesses to his sons shortly before he took office in January 2017. Unlike other recent presidents, he has refused to release his tax returns. Trump often plays golf at his resorts in Florida, New Jersey and Virginia, and Republican candidates and conservative groups frequently hold fundraisers and other events at the Trump International Hotel, a few blocks from the White House. Trump resigned as a director of Turnberry when he took office in January 2017, filings show, but he continues to hold an ownership stake. He earned $20.4 million from the property last year, according to his latest financial disclosure form, released in May. Eric Trump, who along with his brother Donald Jr. serves as a director for Turnberry, wrote that Trump properties do not profit from U.S. government business. "While not required, we have decided that for any United States Govt business, we charge our COST and do NOT profit from these stays. Much more would be spent if they stayed elsewhere," he wrote on Twitter.